Printed electronics / PCBs serve as a cost effective alternative to standard printed circuit boards. 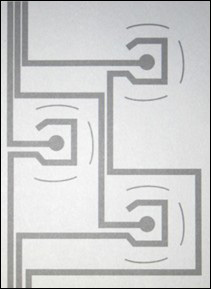 Rather than using a plate up / etch down process to create circuits compose of copper, the printed electronics side of the industry uses screened conductive inks to create interconnects. Often these inks do not have the current carrying capacity of solid copper traces on a 1:1 basis of feature size. This can be overcome by applying a thicker coating. However, this is often not necessary since the typical designs that incorporate printed electronic conductors are purely signal traces, thus not requiring a great deal of current carrying capacity. We typically see printed electronics being used in applications such as membrane switches, flex circuits, solar connectors, antennae, and RFID boards. Screening accuracy; knowledge of materials handling, thin PET substrate material handling. To view examples of this technology, scroll down and mouseover thumbnails. For more information/photos of any particular thumbnail, click the enlarged image.